We provide you with fresh and dried apricot nutrition information and apricot benefits to help you lose weight and eat a healthy diet. Apricots are small, golden-orange fruit with a velvet skin and sweet on taste. Apricots are as healthy as other common fruits such as apples, oranges and bananas (comparing some apricot nutrients, even healthier), but unfortunately the apricot is often overlooked and not as popular as other common fruits. Fresh apricots are low in calories and high in beta-carotene. Three fresh apricots provide half of your daily quota of beta-carotene and only 48 calories, with just 0.4g of fat per 100g serving and no cholesterol. Apricots and weight loss: Being low in calories and high in fiber makes apricot an excellent diet fruit. It is especially high in insoluble fiber, which makes us feel satisfied for longer. Prevents heart disease, reduces “bad cholesterol” and protect against cancer: Powerful antioxidant such as Lycopene found in apricots, helps to promote wellness and strong immune system. Prevents heart disease, reduces “bad cholesterol” and protect against cancer: Apart from fiber, apricots provide a very good source of vitamins A, C, and potassium, and therefore help to protect us against cardiovascular disease. The high levels of beta-carotene in apricots helps prevent formation of LDL cholesterol levels and is believed to promote a healthy heart. Being a powerful anti-oxidant, beta-carotene protects cells from free radical damage, which have potential anti-cancer and anti-aging properties. Boost the immune system: Apricots also contain lycopene, thought to help boost our immune systems. Apricots are beneficial for good eyesight: Vitamin A helps maintain and improve our vision; it stops free radical damage to cells and tissues and lowers your risk of age-related macular degeneration (ARMD). Other apricot benefits: They also contain boron, which promotes oestrogen in post-menopausal women, iron, to help maintain our energy levels, and silica which looks after our nails and hair. Fresh apricots are a seasonal fruit, while dried apricots are available all year around. Dried apricots are a perfect healthy snack; they contain even more nutritional benefits over fresh fruit. They have more than triple the concentration of beta-carotene and fiber, but are also higher in calories and carbohydrates. 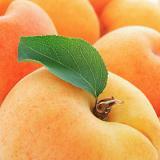 You can compare the nutritional profile of fresh and dried apricot below. When purchasing dried fruits, look for the variety with no sulphur, as sulphur additives can trigger asthma. See our fruit calories comparison chart to compare apricot calories with the other calories in fruit. Also, compare apricot nutrition facts with the other fruits.